Mr. Ahferom Tewolde head of Research and Training at the PFDJ, said that knowledge based on awareness is indispensable for the success of the national development programs. and that of their country and for reinforcing participation in the effort being exerted to build a prosperous country in which its citizens live in peace and harmony. Mr. Ahferom also called on the youth to properly use the educational opportunity provided and equip themselves with the necessary knowledge based on study and research and cope up with the advancement of technology. 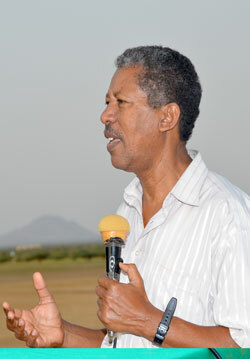 Indicating that the Eritrean people have religions that they are proud of, Mr. Ahferm pointed out that religions in Eritrea are instruments for unity and not for dissection and that respect to each other’s religion and living in harmony have been the noble culture of the Eritrean people for centuries. Mr. Ahferom went on to say that nurturing common understanding on the national issues is vital in the nation building process and called on the youth to enhance unity and nationalism and play due role. The participants expressed readiness to properly use the educational opportunity they are being provided and live up to the nation’s expectation.